ZeroCig has a new addition to its collection of high quality electronic cigarettes and e cigarette accessories. 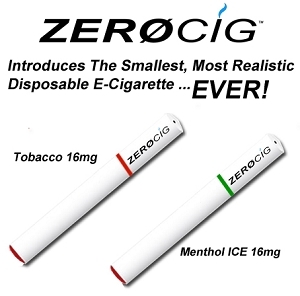 ZeroCig is now offering the most realistic disposable electronic cigarettes on the market today! These new e cigarettes have a slimmed down design and weigh only 8 grams! No longer do you need to charge your electronic cigarette battery when you have the ZeroCig disposable e cigarette. Each of these disposable electronic cigarettes is the equivalent of a pack of traditional cigarettes, with enough power to provide 150 puffs of toxic free vapor. The draw is easy, similar to an analog cigarette, and the powerful atomizer produces dense, full flavored vapor that simulates a traditional cigarette. The combination of size, draw, and flavor of the ZeroCig disposable electronic cigarette make it the most realistic e cigarette available today. They are also offered in tobacco and menthol to accomodate your favorite flavor. Right now, the ZeoCig disposable elctronic cigarettes is priced at only $30 for a 4 pack. When comparing this to other major brands, ZeroCig is the highest quality and most affordable electronic cigarettes on the market today. Click Here for more information, or to order your ZeroCig disposable electronic cigarettes. Don't forget, ZeroCig still provides a variety of electronic cigarettes, and electronic cigarette starter kits. Our starter kits are as low as $19.99 and a 5 pack of refill cartridges for only $9.99! Head over to the ZeroCig home page or Click Here to browse our electronic cigarette starter kits.